Whenever my mother has to make a side dish for rotis, in a hurry, she makes this Tomato Onion Masala, a very easy but extremely tasty one. It requires very few ingredients, the regular items found in the kitchen. 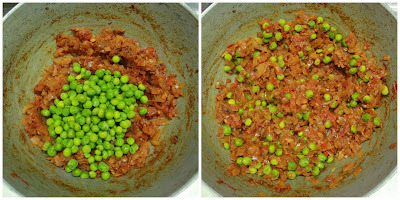 She does not add peas to it, I added them just because I had fresh peas and also it gives a lovely color to this dish. You can also mix this masala with some cooked rice, tastes very good and serve it with some raitha for a complete meal..
Cook the peas in the microwave with a little water and salt, drain and keep aside. This way the peas retain their bright green color. Heat some oil, add the ground fennel seeds, when it sizzles add the onions and saute till it turns pink. Then add the tomatoes, salt, turmeric and chilly powders and saute them till it turns mushy and starts shrinking, and oil starts leaving the sides. 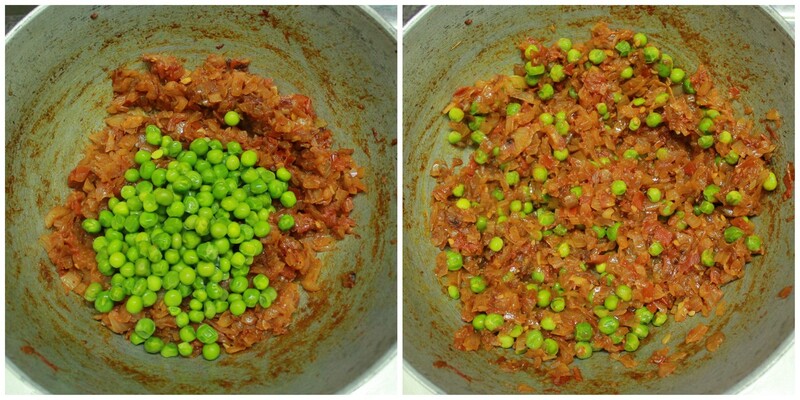 Now add the cooked green peas, mix and saute for another 2 or 3 minutes and remove. 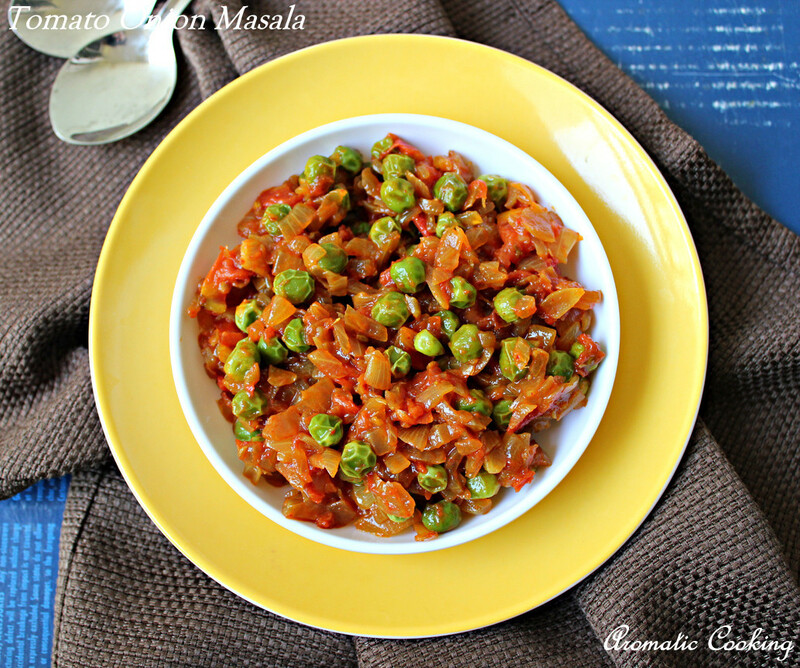 Serve it with some rotis or use it as a sandwich filling or mix it with some cooked rice. You can use this same base and mix in any other cooked vegetable like beans, cauliflower etc. Be a little liberal with the oil, it tastes very good and also keeps well for a week in the refrigerator. Use sour tomatoes to get a good taste. I too make this, but i dont add fennel seeds...looks so yummy. 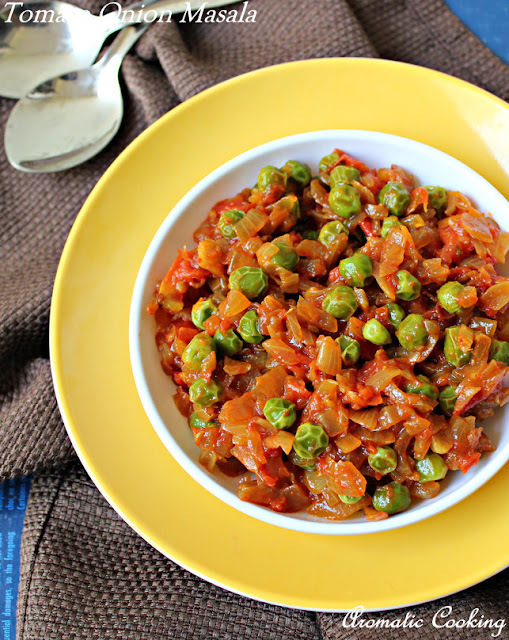 Easy and delicious side dish.. Love the addition of green peas, it makes the dish look colorful and interesting..
Must be perfect with chapatis or pooris :) Yum!! Delicious curry, looks so yummy. Have to try it... seems good and easy! Easy breezy masala, love simply with some rotis. this recipe looks simple and easy... bookmarked! Tomato onion masala looks yumm.